* AVIATION: The government has decided to adopt a "wait and watch" approach for the next three to four months before taking a call on Air India disinvestment. 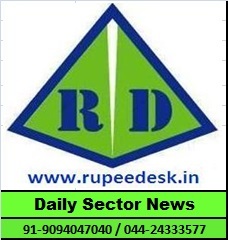 * BANKING: The Maharashtra State Urban Cooperative Banks Federation has objected to the Reserve Bank of India appointing a separate Board of Management for Urban Cooperative Banks. according to the official annual data released by the Swiss National Bank. * CORPORATE: An Enforcement Directorate official dismissed Vijay Mallya's recent offer to settle all his dues if his seized assets were freed up as an attempt at plea bargaining and a bid to bolster his case against extradition to India from UK. * ECONOMY: The proposed revision in minimum support prices of agricultural produce will not hit India's attempts at meeting its fiscal deficit target, Expenditure Secretary Ajay Narayan Jha said. * ENERGY: With the US asking all importers of Iranian crude oil to stop buying the fuel from the West Asian nation, India said that it will take all necessary steps "to ensure its energy security" and "will continue to engage with all stakeholders." * INFRASTRUCTURE: Road Minister Nitin Gadkari will meet bankers today to review loans given to highway projects and to prod bankers to lend more to the sector, a government source said. Global infrastructure fund I Squared Capital's India-based roads and highway platform, Cube Highways, is exploring an infrastructure investment trust for its portfolio of operating roads. * INSURANCE: Life Insurance Corp of India has bought the first issuance of the longest maturity 30-year bonds this financial year, sold by the National Highway Authority of India. November, which is when many of the US sanctions on the West Asian nation take effect. * POWER: Gujarat, Maharashtra, Rajasthan, Bihar and Jharkhand together want to buy 3,000 MW of power under a government scheme to promote purchases from plants without power purchase agreements. * REGULATORY: BSE has revised the circuit limit for the shares of NEW DELHI TELEVISION and 10 other firms to curb excessive volatility in their prices. * TAXATION: The government has said the GST Council will meet on Jul 21 in New Delhi. * TELECOMMUNICATIONS: Telecom Commission is expected to meet today and take up the National Digital Communications Policy, which charts the road map for development of the telecom and digital space.